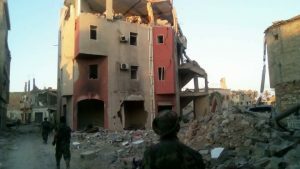 The LNA’s Special Forces Operations Room announced yesterday that they had completed their military operations in the Sidi Khrebiesh area of Benghazi. They also announced that they had gained control over the Al-Balady hotel and its surrounding areas. The Special Forces Operations Room said that it was continuing with its clearing operations in the surrounding areas. Media reports said that there was resistance from ”extremists” in the battle with the LNA. There are other media reports that 6 ”terrorists” were arrested as they tried to escape the LNA. The LNA also suffered a number of injuries, local Libyan media reported. It will be noted that the announcement comes nearly five months after the LNA had announced then that Benghazi had been completely liberated from ‘’terror’’ groups.